1. Boil the noodles for 1 to 2 minutes and drain. 2. Then rinse under cold water and drain again. 3. Add the chives, chilli garlic paste, 1/2 tblsp oil and salt. 4. Toss well to coat. 5. Heat the remaining oil in a large pan over medium heat. 6. Add the noodles and press into the pan with the back of a spoon. 7. Cook for a minute or two and reduce heat. 8. 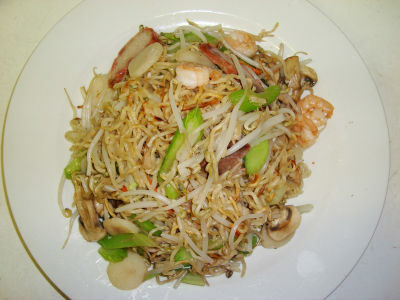 Cook until noodles are lightly browned. 9. Flip and continue cooking till browned evenly. 10. Cut the noodles into wedges and serve hot. 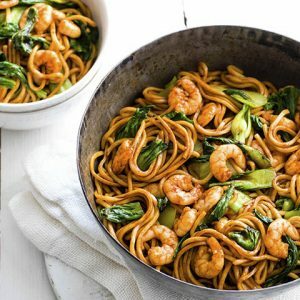 Feel free to comment or share your thoughts on this Panfried Noodles Recipe from Awesome Cuisine.